Have bees invaded your backyard or home? Call us for professional bee removal! The buzzing of the bees is usually a pleasant sound that is indicative of warmer weather or a nice spring day. However, when it’s a loud buzzing indicative of a swarm of unwelcome bees, that sound is less pleasant and more of a panic-inducing dread! Bee removal can be dangerous, especially when the hive has grown to substantial size. 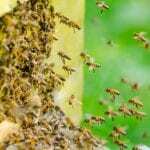 If you are concerned either for your safety or have worried about the hive spreading, it might be time to call Florida Bee Removal for professional bee removal services. After you call Florida Bee Removal, you’ll be impressed by our ability to respond quickly. We understand that a swarm or hive of bees isn’t just unnerving, but can be dangerous to pets and family members, especially those who are allergic. That is why we don’t just respond quickly during our regular hours, but have set up emergency hours as well for those weekends when you finally make it outside only to discover the bees made it there first! Our professional bee removal includes not only the removal of the bees that are squatting on your property, but also the removal of their hives and anything left behind, so that the bees won’t come searching and try to re-build. If you are having a problem with bees or other stinging pests here in Lakeland, Florida, don’t try and get rid of them yourself! Instead, call our experienced team here at Florida Bee Removal for professional bee removal services today.